Hey! What’s up guys? Today, I want to give a little bit of a review on my take for Porch.com. 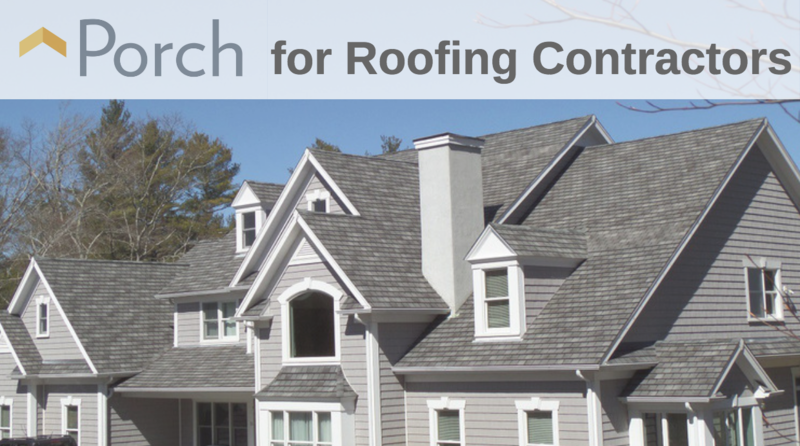 Should roofing contractors take part in? Since the first page of Google is being taken over by directories, being in top directories is part of increasing roofing seo through citations. So, if you’re in the market and looking to enhance your marketing for your roofing company or try out a few more areas to generate leads then this might be one of them. So, I’m going to be going through my thought process for it and a little you know sample that I have you know amongst the people that I talked to first hand I mean clients I’ve worked in stuff I got, not a lot of people are using porch right? So, I kind of classify it as more of an underdog compared to home advisor and you know the big ones. So, having that said from the little sample that I do have in a research I did and a few other takes on it, I can conclude certain things that are right off the bat which set them apart and then we can go on to the thought process or you know the due diligence sort of mindset you can have while you’re trying these kind of platforms . First of all, their refund program is phenomenal right! I thought thumbtack had a pretty good refund program you know they actually refund your leads without you having to pester them or call them. I thought that was really cool, which is cool but for Porch.com it’s a different level right? For example, if you pay for a roof installation lead and then it turns out to be a roof repair lead, they will refund your money which is kind of crazy right? They don’t downgrade you, they don’t you know let’s say you don’t have to pay less or refund a portion. They refund the whole thing. Okay, if it’s a bad phone number right? They have just a like a action basis thing on it where like if it’s a bad phone number the homeowner doesn’t call you back. You at least tried 3 times which is something we should be doing for every phone number anyways um and then they will refund your money right? If you get a call that if the lead was a homeowner who is just basically like in a price shopping, they just want to know an estimate but they’re not even calling you out on the job, they’re not looking to get this job done any time soon maybe like you know sometime in the future. They will refund that money so that’s very, very generous okay? And these kind of things just so you guys know how this works right? Is only possible, really only possible when the platform is busted by homeowners. I’ll let you know what I mean for a second. If you’re doing AdWords right? If you’re doing AdWords and you’re doing paying for PPC right? These kind of refunds is not going to be possible for the agency. I mean usually AdWords people just take a percentage of your marketing spend but let’s say if the agency was just billing you for per lead right? These kind of refunds is not going to be possible for them you know why? Because; they are going into an expense every time the homeowner clicks. So, regardless if they don’t even call, they’re having to pay money so already that’s why I know it’s already hard for AdWords agencies to bill you per call or something at but if they dare to do so, these kind of refunds is going to be impossible. The reason why these platforms like porch, these bigger platforms that are, they’re up and coming and really well-made and Branded can do these things is because homeowners are directly going to Porch.com meaning just like Google or Google Maps when they’re typing Roofing Contractors area, they’re also going to a lot of times Porch.com and finding out, they are looking for roofers in there. So, that lead that is generated did not cost that platform any money and they’re able to pass that on to you okay? So, just so we know how this whole thing works a bit more that’s the whole idea about it. So, guys lastly some practical tips; if you’re going to go ahead and give it a try out. Well you know, I would recommend actually like filling out the platform is one of the things I see that that are very underused, any platform you go into guys it’ll be much better serving if you fill it out. Sounds like common sense but people don’t do it right? Whether it be Yelp, whether it be Porch, anything fill it out to the max, put max out all the pictures for at least 20-25 pictures. I mean if you want to take it to some other, I’ll have them geocode and stuff like that for better search engines. But the point is; put original good pictures, write all the descriptions, put your hours of operation, everything every slot they provide you fill it out and then as soon as it’s like public and link is you know the platform is completed, go get at least one or two your past clients to leave your review maybe even friends and family, I mean I didn’t say that. Just to leave your review because a platform that is empty, you know when people are looking for you and comparing with other people even one star looks tremendously better than no star right? Because; that is looks colorful shiny stars compared to blank gray nothing okay? So, the more the better obviously but at least get yourself one review right from day one so that you can actually be in the game of you know trying out the leads. Anyways having that said, hopefully that helped. I would give it my vote for if you’re in, if you’re going to go and invest in some in one of these platforms, try out Porch right? Obviously, like many other things that’s in this caliber, it could differ between the area you’re in, understand that not all states are the same like people who go online and get reviews for these kind of things that are kind of in a gray area like you know there’s not like hard rule of it’s bad or good, it’s going to depend on your location right? There are states that trust that have a good amount of homeowners that trust certain platforms, there’s states that don’t. It’s just the way it is, okay so you got to have to try it out to give it a full you know like a judgment on it. Okay! So, hope that helped, see you guys next time!